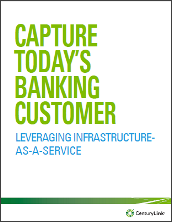 Banks must compete fiercely for new customers and to hold onto the ones they have. That means consistently meeting customer expectations, which is no easy task given the speed with which those expectations are evolving, particularly in terms of Internet and mobile interactions. Banks need to deploy technology that supports their innovative products and services, create customer loyalty and increase business growth. But their legacy infrastructure is generally not adequate, so upgrades or new capital expenditures are required. This is a serious drain on bank’s resources, both in terms of time and money. One possible solution is to utilize infrastructure-as-a-Service (IaaS), which frees the bank to concentrate on products and services that create differentiation. Download this white paper to learn how hybrid IT will help drive innovation to create customer loyalty and increase business growth. Digital and mobile technologies, cost reduction, compliance requirements, and the need to remain competitive, are key drivers to branch transformation - an opportunity for banks to re-think their IT operating model and to find a partner who can offer a large pool of diversified expertise around modern technologies and practices. Wanda Internet Technology and IBM have signed an agreement for the former to enter the public cloud business in China. This will be done via a new firm – Wanda Cloud Company – built on the IBM Cloud Platform.